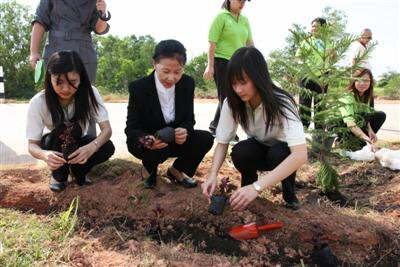 WICHIT, PHUKET: Governor Wichai Phraisa-ngop presided over a tree-planting ceremony along the new road from Wichit to Kathu on Tuesday morning. Dubbed the ‘Lovely Roads, Lovely Phuket’ project, the initiative is one of many around the island in recent weeks marking the birthday of HM Queen Sirikit on August 12. Also in attendance was Senator Phummisak Hongyok, whose Anuphas Vividhkran Company donated the land for the road, designated as Route 4010. Anuphas Vividhkran Company operates the Honda Showroom at the east end of the road. The winding road, which runs 3.5 kilometers from Chao Fa West Road in Wichit though to Prince of Songkla University’s Phuket Campus in Kathu, was built to serve as the main artery though the stalled Chao-Fah City project. About 250 people took part in the planting of two evergreen varieties – island pines and the red-flowering Chinese fringe flower shrub – along the road’s median strip. Teeraporn Jiraratanarkarn, deputy director of the Department of Rural Roads Phuket Office, said the work was a good collaboration between government officers and local people who took part. “We are working together to improve road safety and prevent global warming,” he said.